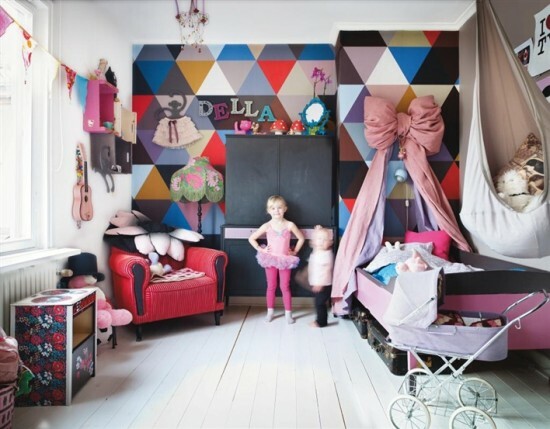 In the lates issue of the swedish magazine Hus & Hem I explain how I think when I decorate childrens rooms. Read the full article here. Often parents decorate according to what they think is neat, but it’s still children who should be in the children’s room the most. Sure, kids are fickle, but has little Olle a pink period: Paint a wall in that color. Foundation walls are easy to do when the taste is changing. Or let the kids get to have any furniture that they may paste and paint as they want. Children love to be creative! To buy the craziest kids furniture is usually only expensive and unnecessary. It is smarter to buy a proper piece of furniture that can hang around for a while instead. For example, a huge coffee table that you paint the color you want, whenever you want. Furnish smart too. Often one feels that there should be a desk in school children’s rooms but if they would rather sit and do homework at the kitchen table, you can use the surface for other things. The storage in children’s rooms is something you’re never quite fathom. But I usually try to find a place in the room that I can concentrate for storage. Perhaps more branches at low line or closets that covers most of one wall. But much is about to clean out. Have a few buckets of toys in the attic, which may rotate – it feels toys are always new. It is often said that the interior can easily become boring if you furnish along the walls. But the children’s room, I actually think it’s a good idea, so that children get space to move around. We have rings in the ceiling that Della has hung in since she was two years and they are always a hit when friends visit. Climbing walls are also fun and encourages physical activity. I like the permanent solutions which are nevertheless easy to modify. As clothespins on strings attached on the walls where you attach photos, posters, small stuffed animals and stuffe. Or a picture wall as to change the motives of when one feels like. Chalk board paint is also super popular. Paint on such boards, pieces of furniture or walls, it’s free for kids to decorate new every day. All photo’s by Peter Phillips. Wow! I think I want a full sequin outfit! Where is that jacket from?! It’s from swedish store Åhléns – right now on sales! Kjempespennende! Skal lese intervjuet nå! Ang hva dere skal skrive mer om…glemte å kommentere dette under den posten….jeg leter etter gode ideer for å utnytte plassen på små barnerom og når 2 deler et lite rom sammen…Vi har bygd en ekstra lang hems, slik at barna sover i hver sin ende, og jeg har sydd gardiner slik at de har hver sin lille hule. Vi har også hengt opp hyller høyt på veggen, samtidig som vi har flere hyller nede tilgjengelig for barna. Utfordringen min, er at jeg synes det blir så fullt inne på rommet. Jeg vil gjøre det attraktivt for bara å være der…altså konklusjon, vil gjerne få tips om utnyttelse av plassen på trange rom og når to deler ;) Tusen takk! Siw – send me a photo maybe I can help. Det här rummet kan jag inte sluta titta på. Det är himmelskt fint! Did you make the big bow above the bed yourself? I would love to learn how to make one! Heey Lacy, well I took one long piece of fabric. and just made two loops. In the middle I made a little piece of fabric around the loops – to tie them together. Then I put a screw through the fabric and straight into the wall, and hid it under the fabric that ties the loops. do you understand- otherwise just ask again. Hi, that s good tips!! I Love this colourfull wall you made, is this painting or wallpaper? I have just come over from AT- now it’s your turn, come over and decorate my sloppy house… please? ;) Amazing work, im inspired! I’m having a baby girl and was wondering if you would be able to put a DYI of how you made that beautiful bow! I would really love to know so I can add it to my nursery. Love from all the way in Australia! Could you send me the references of that beautiful wallpaper? Thanks a lot. Can i borrow somes photos for an article on my blog about kidrooms? Isabelle: sure if you link back to us- no problem! Hello Isabelle. I am french. I like very much the big bow, would it be possible to make one for my daughter and to sell it to me ? I Will pay you !! !